Product is FDA registered in USA. Made by USA company HealthyLine™. You can see a great source of information, instructions and useful resources about your latest model right on HealthyLine. Many people can enjoy and see improvement after the first use, BUT usually, it should take a 2-3 month of consistent usage to feel strong results. Mat fully loaded with natural healing gemstones from Edge to Edge or from left to right. We have a dozen models of our controllers. We always provide the best one. If you see a different controller in your package it means that one is the best fit for your model. Controller instruction can be found on Healthyline. NATURAL HEAT THERAPY - These heated pads contain jade and amethyst, tourmaline stones that, when heated, emit negative ion that help heal, detoxify, and rejuvenate the body. INFRARED IONIC SUPPORT- Natural rays emitted from our heating pads help promote natural healing of joint and muscle pain and cardiovascular system. 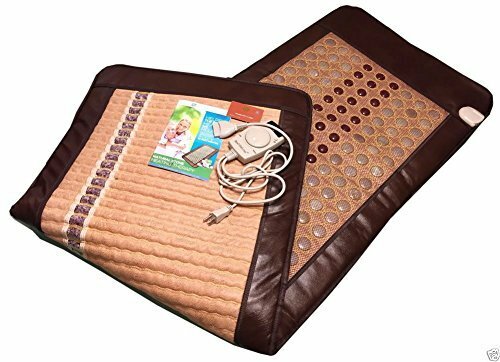 COMFORTABLE SIZE - At 72" x 24" in size, our far infrared heating pad is not only relaxing but provides relaxing mood support for men and women alike. INCLUDES FOIL BLANKET - Each deep heating pad also comes with a premium foil blanket that encourages weight loss through a natural sauna effect. US BRAND FDA REGISTERED - HealthyLine products are safe, effective and US FDA registered to provide reliable support. Also backed by a 1-year warranty.